Life changing events inspire people. Some write, some create music, others create art, and some- Get Inked! I will start by saying that I love tattoos. I love them for me and I love them for my husband. If I had no other financial obligations, I would have several tattoos. But for now, I have 3. My tattoos all have a spiritual meaning but only one truly makes me feel connected to God, to the Universe. Three years ago I would have never even begun to imagine where I sit in my life today. Three years ago, I devoted my days to caring for non human primates and my evenings to dogs and families in need of training. Three years ago I lived in Salt Lake City, Utah. Three years ago James and I finally felt ‘ready’ to start a family. Three years can be both an eternity and a flash. Although I do not feel like a different person, I sometimes look at my life from an observer’s point of view and feel as though I am indeed watching a movie about someone else. I have witnessed more miracles and had increasingly more intricate roles to play in the universal design then ever in my life- all in the last three years. I have been humbled by the power of humanity as well as the power of prayer. I have known true angels that walk this earth. I have a much deeper connection to Mother Earth which has given me such a profound understanding and respect for life. All life. Life itself has become so much more important to me now. I wanted to celebrate. I wanted to celebrate the catalyst for all of these events…..you guessed it, that would be Lily! I decided thoughtfully on what tattoo would best express Lily. 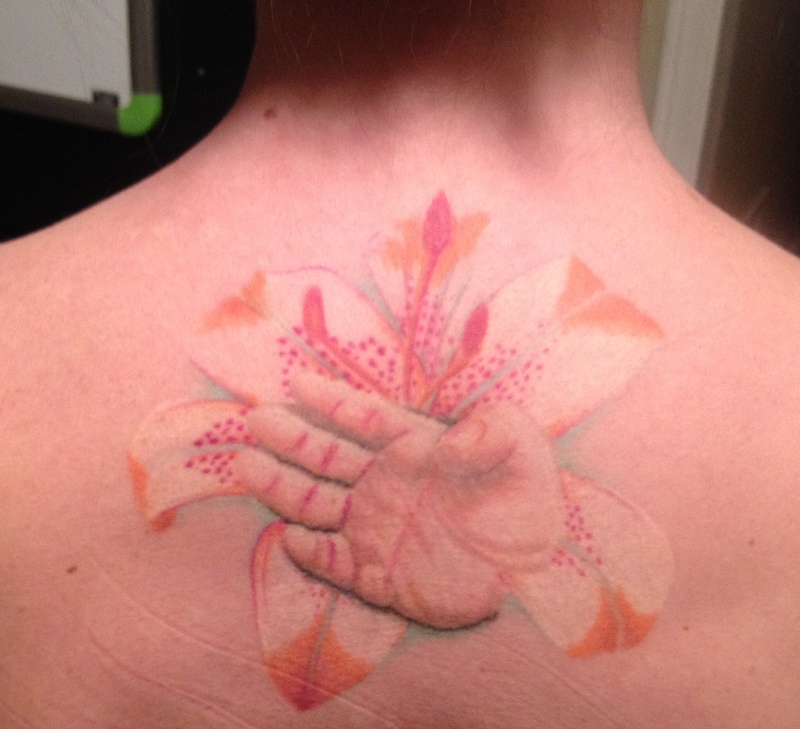 A flower, (of course this would be a Lilly), and a portrait of her hand, palm up. Some people with DS have a single crease on the palm of their hand instead of 3 creases. This is called a Simian or Palmer’s crease. Although it is relatively meaningless medically speaking, it does represent Down syndrome for me because Lily has this crease. I love you with all my being, all my soul. My love has no depth for it is beyond measurement, time, and space. Although one day you will venture off on your own, I carry you with me always as we shall journey together through this life. This entry was posted in Down Syndrome Awareness Month, Lily's Land of Oz and tagged Down syndrome, God, Hands, Health, Lily, Love, Palm, Salt Lake City, Tattoo, United States. Bookmark the permalink. I ❤ your tattoo. I've been interested in possibly getting a tattoo of Spencer's newborn footprint (complete with common toe gap), but lately I've been trying to figure out what I would get inked to represent my other children. I love my children and while DS has certainly been a huge thing in our lives, it doesn't lessen my love for my other children. I totally get where you are coming from! I plan on getting a tattoo in honor of Oz once I get to know him a little better. I struggle between DS being a part of who she is wothout it defining her.